SolarWinds Network Topology Mapper (NTM) shows nodes on your network, indicates and updates status both for the nodes and the network connections between them in interrelated, scalable maps with customizable icons. 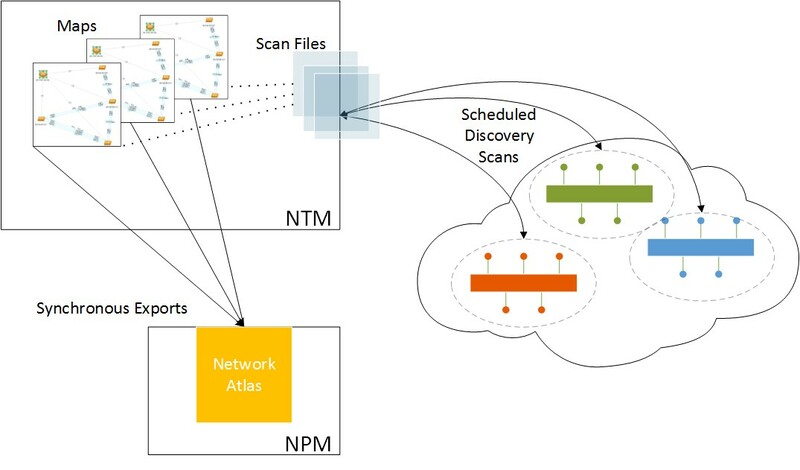 The topological overview of NTM complements your network monitoring system [SolarWinds Network Performance Monitor (NPM)], by showing how an issue with a particular node impacts larger aspects of your network. NPM lists alerts in order or urgency and NTM distributes alerts on a map. For example, NTM indicates if a particular switch sits in the path of all other alerting nodes. For a stand-alone installation of Network Topology Mapper, install the product on a dedicated server. This installation assumes you have not installed any other SolarWinds Orion Platform products on the server. Network Topology Mapper does not support integration with SolarWinds Orion platform products. To integrate NTM maps into the Orion Web Console, export maps from NTM, and import them into Network Atlas. Network Topology Mapper supports an evaluation installation with a trial period. This installation is a full installation of the product with a 14-day license. To continue with a full product license, contact SolarWinds Sales.